The Second Epistle to Timothy is one of the three Pastoral Epistles, traditionally attributed to Paul, and is part of the canonical New Testament. Even those who reject 2 Timothy's authenticity, however, generally agree that whoever the author really was, he also wrote 1 Timothy and Titus--all three referred to collectively as the Pastorals. Evangelical tradition generally regards 2 Timothy as having been written late in Paul's life, c. 60-67 CE, during a period of imprisonment. 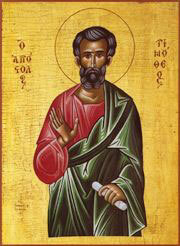 Critical scholars often suggest dates much later, well after Paul's death (c. 64-67); ranges in the first half of the second century are frequently offered. In his letter, Paul urges Timothy to not have a "spirit of timidity" and to "not be ashamed to testify about our Lord" (1:7-8). He also entreats Timothy to come to him before winter, and to bring Mark with him (cf. Philippians 2:22). He was anticipating that "the time of his departure was at hand" (4:6), and he exhorts his "son Timothy" to all diligence and steadfastness in the face of false teachings, with advice about combating them with reference to the teachings of the past, and to patience under persecution (1:6–15), and to a faithful discharge of all the duties of his office (4:1–5), with all the solemnity of one who was about to appear before the Judge of the quick and the dead.